This unique outdoor table combines steel and reinforced concrete construction to create an ideal table for any outdoor dining area. Superior weather resistance requiring very little maintenance. Heavy weight protects from theft and steel reinforced table top and seats offer resistance to vandalism. 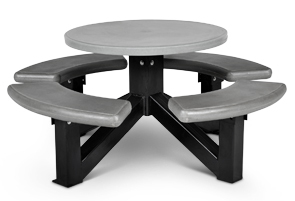 Concrete table top and seats come in a smooth finish, while the steel legs come in a variety of powder-coated colors. Color options are available as shown. Top & Seats - Smooth Finish Concrete. Frame - Powder-Coated Steel Color Options.